There’s no denying that the way in which potential customers research a business has drastically changed in recent years. While word of mouth marketing is still as important as ever, building a strong online presence is no longer optional – it’s become a must. When clients Google you, they should stumble upon a beautifully designed website that showcases your services in style. And when you’re running a spa website, displaying your info with elegance and grace is even more important. Stand out from the competition by choosing one of the best spa and salon WordPress themes currently on the market. No list featuring the best spa and salon WordPress themes would be complete without this one. 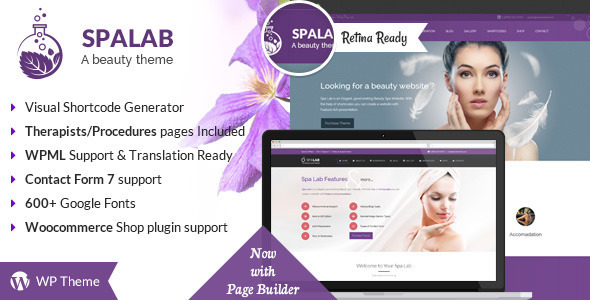 Spalon was specifically designed for spas, salons, yoga classes and beauty treatment businesses, so you can be sure it includes all the necessary tools to put together your dream site. It also comes with WooCommerce support – thus, you can sell products and services directly from your website. Attractive home layouts, WooCommerce support, and easy customization options recommend Lemon to anyone looking to launch a spa website. Its flawless design doesn’t hurt either. Lemon is optimized for speed and SEO, as well as 100% responsive. The theme comes bundled with four premium plugins, so you can save some serious cash. We’re talking about Visual Composer, Slider Revolution, Masonry Grid Resize Builder and Lemon Grid. A great investment for sure. Dream Spa offers a complete solution for anyone looking to launch a modern and posh spa website. It comes fully packed with templates, widgets, shortcodes, and custom posts to best showcase your services. Flexible and easy to customize, the theme is also WPML compatible and SEO optimized. Furthermore, the awesome page builder included with Dream Spa is user-friendly and intuitive, so building a rocking site will be piece of cake. Kicking off our list of the best spa and salon WordPress themes available, Spa Lab has a lot going for itself. It comes with a suite of essential features like two types of menu card designs, therapists, reservation, gift cards, product, shop, and more. It also offers a powerful theme options panel to make sure the site will fit your brand perfectly. You can create gallery pages for services/treatments, run a blog, capture leads with newsletters and offers. Spa Lab is also WooCommerce ready, so you set up a shop and sell products with ease. The world in your oyster. Jacqueline aims to make promoting your business online a walk in the park. You get access to several pre-built pages, the premium Visual Composer plugin is included with this theme, and you can also take online bookings, since the theme is compatible with Booked. Jacqueline also comes with full WooCommerce support, so you can sell goods and services directly from your website. Its stunning layouts and powerful store functionality clearly make it one of the best spa and salon WordPress themes currently available. 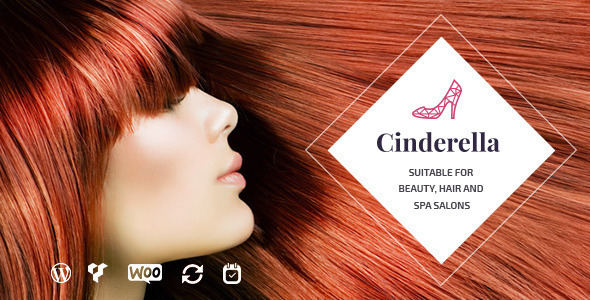 Rounding up our list of the best spa and salon WordPress themes, Cinderella shines thanks to its elegant design and great features. Due to its intuitive interface and flexible Visual Composer Page Builder, the theme is easy to modify and quite enjoyable to use. It offers a convenient booking form, tons of customization possibilities, and great support. All in all, a great choice for anyone wanting to make a splash in the wellness industry. 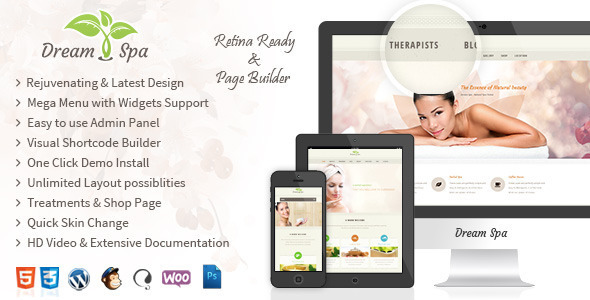 This premium spa theme includes a couple of advanced features, including a sliding menu card with an easy to use menu card builder and a tiled gallery page for treatments, products and services. On top of that, The Beauty Salon is flexible, versatile, and easy to use. The special Product Page allows you to share additional information about your services, while the custom shortcodes and widgets are great when looking to customize your site. Wellness offers four preset skins to choose from, an intuitive skin customizer, and an eye-catching booking form. A responsive slider is included for beautiful animation effects. Clean, minimal, and fully-functional, this theme is highly recommended for those looking to keep simple and rid themselves of any unnecessary features. Gorgeous and insanely user-friendly, Beauty offers a plethora of features anyone running a spa website or beauty salon will find useful. It’s light and clean design is a thing of… well, beauty. Not only that, but the theme also comes with a real-time customizer and the Visual Composer plugin, so setting up your website will be a breeze. Moreover, Beauty also packs powerful plugin integration and was translated into 14 languages, so you can reach a wider audience. If you’re looking for a theme that will help you set up your site as quickly as possible, look no more. 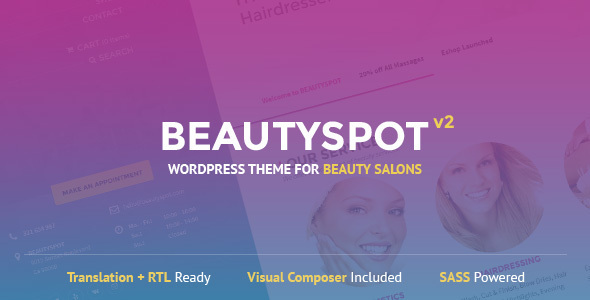 Beauty Spot bundles the Visual Composer plugin, so you can drag and drop elements to create an eye-grabbing design. It’s easy to install and customize, translation ready, and comes with 8 predefined skins to choose from. The theme is also ready for WooCommerce and Mailchimp, giving you access to all the features you need to build a fully-functional site in no time. Last but not least, your clients will be able to make appointments or get your beauty salon contact info right from their mobile devices. How cool is that? 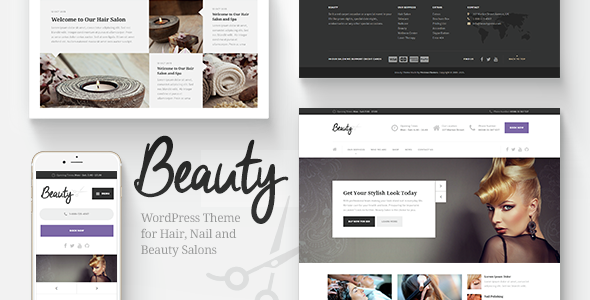 Why Choose One of the Best Spa and Salon WordPress Themes on Our List? When it comes to the wellness industry, the competition is fierce. Potential customers are no longer looking only for proximity to their home or work, they want to go somewhere they can truly relax and enjoy a variety of quality services. The best spa and salon WordPress themes featured on our list all come with easy customization options and powerful admin dashboards to help you create stunning websites quickly and without any outside help. Moreover, most of them offer dedicated tables to highlight working hours, beautifully designed team pages, and gorgeous service sections. You will be able to showcase all the info a potential client may need and dazzle them with modern design and awesome functionality. If that doesn’t make you stand out from the competition, we don’t know what will. 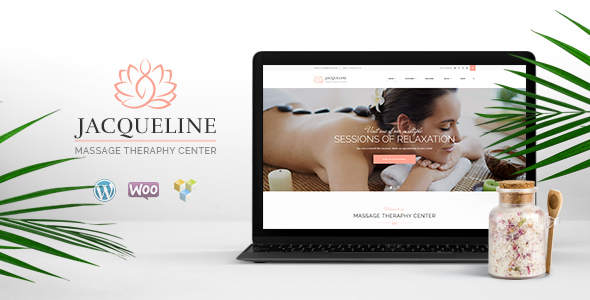 The best spa and salon WordPress themes on our list were designed specifically for the wellness industry and come packed with all the features you might need to build an exquisite website. Play with high-quality photos and sliders to give clients a glimpse of what they should expect when they book an appointment. They will keep coming back for more. As always, for more WordPress tips and tricks keep browsing our website or subscribe to our newsletter. We’ll keep you up to date.